Grantham redirects here. For Grantham South, see Colsterworth. Moto own these small facilities at the Gonerby Moor junction. Prices are paid using PayByPhone - more details. The location code is 2440. The fees are strictly enforced by CP Plus. Evidence of the Little Chef name can still be seen. The services can be used to access an adjacent Downtown superstore and garden centre. 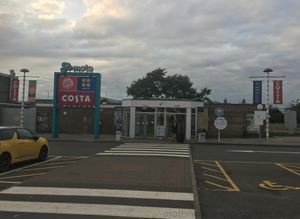 It is known locally as Gonerby Moor services. Grantham used to be directly accessed from the A1 southbound, with a roundabout to the north allowing northbound traffic to access it and a loop road back to the roundabout allowing them to get back. In 2007 the Highways Agency brought the A1 to the west of this interchange, with the old road becoming the southbound sliproads and a new bridge being constructed for northbound traffic. When it opened, Grantham called itself a "transport service centre". It is labelled as such on a 1974 map. It was built by Forte to be used by Little Chef, but became property of Granada when the company were taken over. Granada extended the building to add a Burger King. After Granada became Moto they later converted the Little Chef to a Costa. 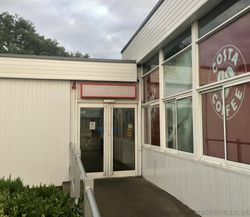 The central corridor linking the toilets to the shop and restaurant/café was originally in the open and was covered over in the late 1990s.